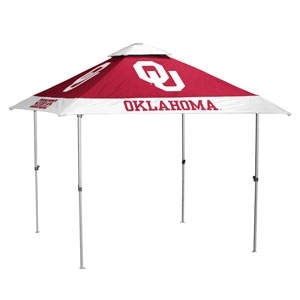 The University of Oklahoma Sooner Pagoda Canopy boasts the most deluxe features of pop-up tents. Solo-up technology allows a single person to easily and quickly setup the tent. The durable steel frame has 3 levels of height adjustment and supports a canopy with suspended overhang valence giving 10 x 10 ft of coverage. A removable solar panel is situated on top to power an interior LED lighting system. A fully charged solar panel can power the lights for up to 8 hours.